Thanks to Psy's "Gangnam Style" smash hit, the South Korean music industry's long-held dream to make it big in Europe and the USA with its K-pop boy bands has taken a giant leap forward. 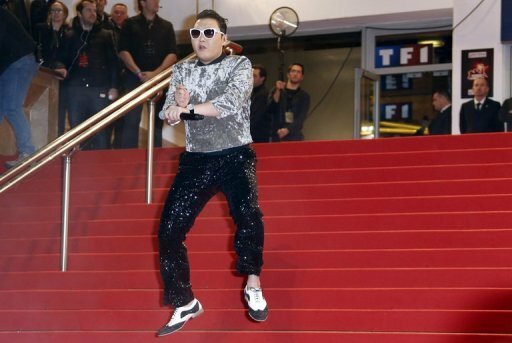 South Korean singer/rapper Psy dances on the red carpet upon arrival at the Palais des Festivals on January 26, 2013 in Cannes. But Psy's international success looks unlikely to have a big knock-on effect in other Asian countries, experts said at the MIDEM music industry gathering in Cannes. To build on the momentum of the "Psy" phenomenon and showcase some of their other big stars, South Korea's music industry has turned out in force to attend the annual four-day trade fair that opened its doors on Saturday. "The Western markets have always been a kind of romantic dream and an end goal for the South Korean record labels," Clayton Jin, CEO of the country's most respected music data service, Billboard Korea, said. "However, Korean labels are very realistic and Asia remains their bread and butter," Jin stressed, adding that Asia continues to be the region where the country's labels are most successful, with Japan alone accounting for about 50 percent of Korea's music exports. It's only very recently that the South Korean music business has started to eye up the US and European markets, Jin said in an interview. The first K-pop concerts held outside Asia were organised in the States and Europe in 2011 and did much to increase the musical genre's popularity. In terms of sales, however, the slick boy and girl-band routines proved successful only in a handful of niche markets, industry experts noted. "The American market and the European market represented just 0.5 percent of South Korea's total music exports," Min Kim, who heads up Kocca, a non-profit organisation that promotes the country's content industry abroad, said. But all that changed when rapper Psy unexpectedly shot to fame and his quirky "Gangnam Style" video notched up a record one billion views on YouTube. "Before Psy, Western people associated Korea with IT, now with Gangnam Style they associate the country with music," Kim noted. Psy's success has convinced many Western music industry insiders and fans take a closer look at K-pop, he added. "Now music fans are actually giving this music a chance whilst before they thought it was just some ethnic music genre and didn't pay much attention to it," Kim said. Psy's success has also boosted the confidence of other Korean artists and their management companies who didn't think it could be financially viable to tour in Europe and the US, Jin added. Today, the industry believes that with the right investments and the right artists, they can make a meaningful push into these markets, he said. Psy has also had an impact on how the music industry operates in his own country. "Before, the artists' management companies had a very tight control over their artists. "But the reason why Psy succeeded where so many other Korean artists failed was that he had a very open contract, so that as soon as his 'Gangnam Style' single started taking off on YouTube, Psy was able to move to the United States and sign with (new manager) Scooter Braun," Jin said. Other Korean artists are now clamouring to follow in Psy's footsteps. South Korean girl band "Girls Generation" has signed with Interscope in the US, the label behind Lady Gaga and the Black Eyed Peas, and is coming out with an English album in March. But industry experts at the trade fair cautioned that the "Psy" phenomenon was unlikely to be easily copied in other Asian music markets -- or even at home. Malaysia, for instance, faces a language barrier to promoting their songs abroad as there are four different main languages in the country, the chairman of the Recording Industry Association of Malaysia, Norman Abdul Halim, said. South Korea's big music success in Japan may also be on the wane, Japanese industry experts said here, as Japanese music fans are starting to get bored of the pre-packaged Korean tunes and are hungry for something new and fresh. And Psy's success hasn't necessarily made things easier for South Korean artists in other musical genres such as hip-hop and dance, Tasha, the female vocalist of the band Drunken Tiger, said. "In one way, it's made things even more difficult because a lot of people now expect all Korean music to be like Psy's music," she said with a wry smile.